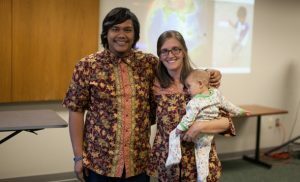 The honorees at Eastern Mennonite University’s Oct. 13 Homecoming and Family Weekend worship service included a pastor and social justice activist, a couple who has devoted themselves to a community of healing for those in mental health distress, a woman who lives among the poor of Asia, and a well-loved music professor, who has, among other gifts, has crafted many of the university’s beautiful, thought-provoking worship services. After lofty choral anthems, congregational singing and Bible readings, the audience of several hundred listened to the 2016 alumni award winners, who reflected on the words of the prophet Micah — Do justice, love mercy, and walk humbly with your God — on their life and work. Harvey Yoder, ’64, SEM ’99, was the first speaker, his theme of “do justice” an apt choice. Yoder is a pastor, counselor and social justice advocate in Harrisonburg and the broader community. 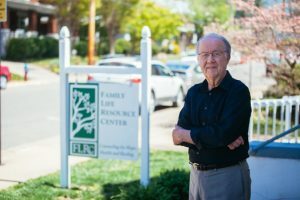 One such experience at EMU, visiting inmates in a local jail, led to a lifetime of advocacy for criminal justice reform. Yoder named two men he has advocated for, Charles Zellers Sr. and John Bennie Williams, and shared of their repeated denial of parole requests. Among the experiences of life that made him “wonder and reflect,” Wayne Burkhart ’67 said, was the loss of his son 22-year-old son Christopher. 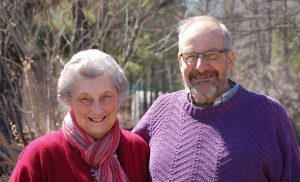 Wayne and his wife, Donna ’69, recipients of the Distinguished Service Award, were recognized for their years of dedication to Gould Farm, a therapeutic residential community for those learning to manage psychiatric disorders in Massachusetts. Grace compares the journey of walking with Jesus to walking as a baby learns, step by step under the watchful eye and helping hand of a parent. This is not a clean or comfortable calling, but it is a way to God, she says. Professor Ken J. Nafziger led the service, weaving together congregational and choral singing, scripture and reflection in a way he is known for across Mennonite Church USA and beyond. Nafziger will retire this May after 40 years with EMU’s music department, which includes founding the annual Shenandoah Valley Bach Festival more than 25 years ago. He is artistic director and conductor of the festival. Saturday afternoon, he was joined by 50 former Chamber Singers for a time of reminiscing — both funny and profound — about experiences as members of the choral group. And they also sang together. At Sunday’s service, advancement associate Braydon Hoover, a former Chamber Singer himself , shared a few anecdotes and thanked Nafziger for his dedication to music excellence, student musicians and a lifetime of service to EMU, as well as the broader church. The Chamber Singers alumni provided the final selection of the worship service, “Dona nobis pacem” [Grant us peace], the concluding chorus of the Bach Mass in B Minor. In the group were five sets of parents and children: Kendra Good ’85 Rittenhouse and son Steven ’11, Michael Bishop ’81 and son Jonathan, Andy ’90 and Tina Martin ’89 Grove with son Dylan; Fred Kniss ’79 and sons Mike ’06 and Steve ’11; and Pam Risser ’80 with daughter Leah ’11. 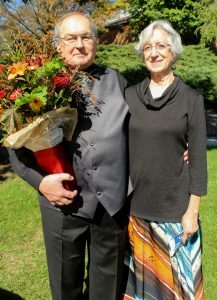 Nafziger was presented with a fall bouquet in appreciation by Jeff Shank, director of alumni relations and parent engagement.